Immobiliser le rachis: Comme il faut ! Hyldmo PK et Al. Acta Anaesthesiol Scand. 2016 Mar 7. doi: 10.1111/aas.12714. Background: Endotracheal intubation is not always an option for unconscious trauma patients. Prehospital personnel are then faced with the dilemma of maintaining an adequate airway without risking deleterious movement of a potentially unstable cervical spine. To address these two concerns various alternatives to the classical recovery position have been developed. This study aims to determine the amount of motion induced by the recovery position, two versions of the HAINES (High Arm IN Endangered Spine) position, and the novel lateral trauma position (LTP). Method: We surgically created global cervical instability between the C5 and C6 vertebrae in ﬁve fresh cadavers. We measured the rotational and translational (linear) range of motion during the different maneuvers using an electromagnetic tracking device and compared the results using a general linear mixed model (GLMM) for regression. In the recovery position, the range of motion for lateral bending was 11.9°. While both HAINES positions caused a similar range of motion, the motion caused by the LTP was 2.6° less (P = 0.037). The linear axial range of motion in the recovery position was 13.0 mm. In comparison, the HAINES 1 and 2 positions showed signiﬁcantly less motion ( 5.8 and 4.6 mm, respectively), while the LTP did not ( 4.0 mm, P = 0.067). Conclusion: Our results indicate that in unconscious trauma patients, the LTP or one of the two HAINES techniques is preferable to the standard recovery position in cases of an unstable cervical spine injury. Collier cervical: Pas utile ? La mise en place d'un collier cervical est une mesure classique en traumaotlogie routière. Elle n'est cependant pas recommandée en cas de traumatisme d'origine ballistique. La probabilité de lésions instables du rachis semble faible surtout si il s'agit de blessures survenues lors de combat à pied et sans atteinte crânienne associée. L'étude présentée conforte cette position. The injury pattern from improvised explosive device (IED) trauma is different if the target is in a vehicle (mounted) or on foot (dismounted). Combat and civilian first response protocols require the placement of a cervical collar on all victims of a blast injury. We searched the Joint Theatre Trauma Registry (JTTR) and the Role 3 Hospital, Kandahar Airfield (KAF) database from Mar. 1, 2008, to May 31, 2011. We collected data on cervical fracture; head injury; traumatic amputation; initial blood pressure, pulse, injury severity score (ISS), Glasgow Coma Scale (GCS) score and base excess; and patient demographic information. The concordance rate between JTTR and KAF databases was 98%. Of the 15 693 admissions in JTTR, 326 patients with dismounted IED injuries were located. The rate of cervical collar prehospital placement was 7.6%. Cervical fractures were found in 19 (5.8%) dismounted IED victims, but only 4 (1.2%) were considered radiographically unstable. None of these 19 patients had prehospital placement of a collar. Patients with cervical spine fractures were more severely injured than those without (ISS 18.2 v. 13.4; GCS 10.1 v. 12.5). Patients with head injuries had significantly higher risk of cervical spine injury than those with no head injury recorded (13.6% v. 3.9%). No differences in frequency of cervical spine injury were found between patients who had associated traumatic amputations and those who did not (5.4% v. 6.0%). Dismounted IED is a mechanism of injury associated with a low risk for cervical spine trauma. A selective protocol for cervical collar placement on victims of dismounted IED blasts is possible and may be more amenable to combat situations. Wilderness medical society: Practice Guidelines for spine immobilization in the austere environment. Neutral alignment should be restored and maintained with light or moderate manual cervical traction during extrication, unless such a maneuver is met with resistance, increased pain, or new or worsening neurologic deficit. Patients requiring extrication, when the cervical spine cannot be cleared before extrication, should be placed in a cervical collar and allowed to exit the situation under their own volition if alert and reliable. Otherwise extrication should be performed with a KED (or similar device) plusc ervical collar,and the immobilized patient moved in a sitting position onto a long spine board, vacuum mattress, orsimilar device. 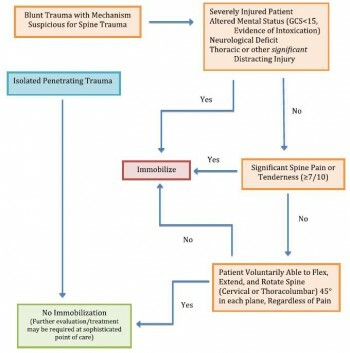 Spinal immobilization should be considered in patients with evidence of spinal injury, including those with neurologic injury, and those patients who have experienced severe trauma and are unconscious or exhibit altered mental status. The cervical collar (or improvised equivalent) should beconsidered one ofs everal tools available to aid in immobilization of the cervical spine. It should not be considered adequate immobilization in and of itself, nor should it beconsidered necessary if adequate immobilization can be accomplished by other means, or if the presence of the collar in itself compromises emergent patient care. Vacuum mattress provides superior immobilization, with or without a standard cervical collar, and improved patient comfort (with corresponding decreased risk of pressure sores) and is preferred over a backboard for immobilization of either the entire spine or specific segments of concern. Appropriately trained personnel, using either the NEXUS criteria or the Canadian C- spine rule, can safely and effectively make decisions in the prehospital setting about whether or not ac ervical spine should be immobilized. Les lésions du rachis sont plus fréquentes que ce qui était supposé. Ce travail rapporte qu'une atteinte du rachis est présente dans 11% des cas. Une des explications est que l'amélioration des conditions de prise en charge permet la survie de blessés plus graves qu'auparavant, qui autrefois ne survivait pas à leurs blessures. Spinal cord injuries were most likely to occur in Afghanistan (incident rate ratio: 1.96; 95% confi dence interval: 1.68–2.28), among Army personnel (incident rate ratio: 16.85; 95% confidence interval: 8.39–33.84), and in the year 2007 (incident rate ratio: 1.90; 95% confi dence interval: 1.55–2.32). 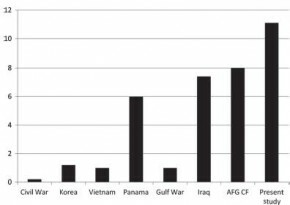 Spinal injuries from gunshot were significantly more likely to occur in Iraq (17%) than in Afghanistan (10%, P = 0.02).